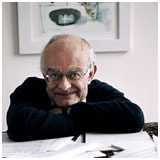 John Milford Rutter CBE (1964), born 24 September 1945, is a composer and conductor, best known for his choral music. He read music at Clare College and became the College’s first full-time Director of Music in 1975, leading the Choir to international prominence. In 1981 he founded his own professional choir, the Cambridge Singers, with which he has made many recordings of the sacred choral repertoire. His choral works, including the well-known Shepherds’ Pipe Carol, Requiem, Gloria and Magnificat, are frequently performed around the world. His setting of Psalm 150, commissioned for the Queen’s Golden Jubilee, was performed at the Service of Thanksgiving in St Paul’s Cathedral in 2002. The following year his Mass of the Children, a major work for adult and children’s choir, soloists, and orchestra, was premièred in New York’s Carnegie Hall. In addition to his composition and conducting, he also works as an arranger and editor, most notably of the extraordinarily successful Carols for Choirs series in collaboration with Sir David Willcocks. In 1980 he was made an Honorary Fellow of Westminster Choir College, Princeton, and in 1988 a Fellow of the Guild of Church Musicians. In 1996 he was awarded a Lambeth Doctorate of Music in recognition of his contribution to church music. He was elected to an Honorary Fellowship of Clare College in 2001 and was awarded a CBE in the 2007 New Year’s Honours for services to music.